The look we got earlier is definitely real! And now we have all 8 characters! 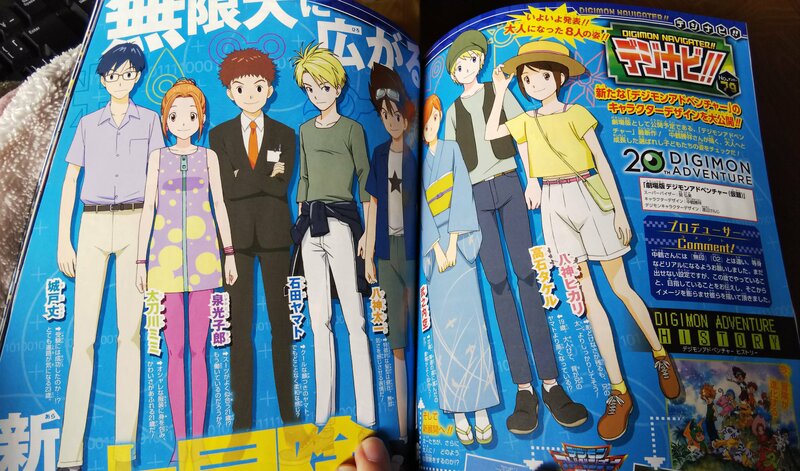 The new designs are all done by Katsuyoshi Nakatsuru, the character designer from the original Digimon Adventure anime. Jou- His hair's blue again! Mimi- She looks very Mimi! Yamato- An interesting casual look. Taichi- Touched up heavily from early art, including more classic style goggles. Sora- The kimono brings to mind her story up until now. Hikari- An interesting and stylish casual look? And a hat! There's also a decent chunk of text, which we hope to have a translation for soon. And hopefully better quality images soon! Thanks to akatuki for the image. Feel free to continue conversations from the prior thread here. Update- Better images thanks to Ayushi who took a small stack of photos of the magazine and sent them over without shrinking them so I could do so minimal cleaning up of the photos she took. And on top of the new images, we have translations thanks to garm! Jou: Did he manage to pass his entrance exams...!? A 23-year-old whose choice of career path is of great interest. Mimi: A charming 21-year-old dressed in fashionable clothing! Koushiro: A 21-year-old who looks great in a suit!? Could he be working at a job already? Yamato: Yamato with his ever calm and collected expression. He seems to have a gentle air to him too!? Taichi: He still sports his signature hairstyle. His expression accurately reflects his carefree personality! Sora: 22 years old. Did she decide to devote herself to the art of Ikebana!? Her kimono suits her perfectly! Takeru: 19 years old and all grown up, he's grown even taller than his older brother Yamato!? Hikari: While her innocent personality still remains, she seems to have her act together more than her brother Taichi does! Producer Comment: We requested that Nakatsuru-san design these with more realistic proportions, as opposed to the designs from Adventure and 02. Although we cannot reveal all the details just yet, we wanted these designs to amplify the image of each of the children that we want to project to the audience, which would showcase what each of the children are doing now at their age and what their future goals are. And so, a new story unfolds!! 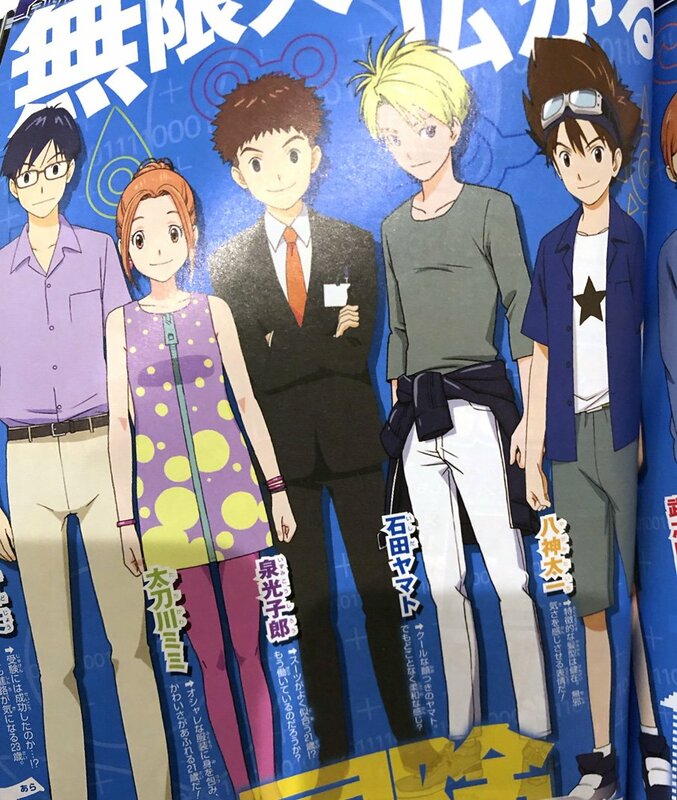 - Taichi and the other children have all grown up! What kind of adventure will they go on this time? Big thanks again to Ayushi and garm! and they do all look like older versions of the kids, so I suppose that's good but I dunno, I feel disappointed tbh - the same art style as the first season makes it kinda stale to me. I liked the freshen up Tri had, and would've liked a different art style than the first season, but still they look like how they actually should based on the first season art style. but still, I guess seeing this - I prefer what they used in Tri. Still not feeling Taichi with shorts, but his new touched up look. Looks great. Everyone else looks perfect. I'm pretty happy that we have their old hairstyles back. Well variations of it, but still enough to individualize the kids. 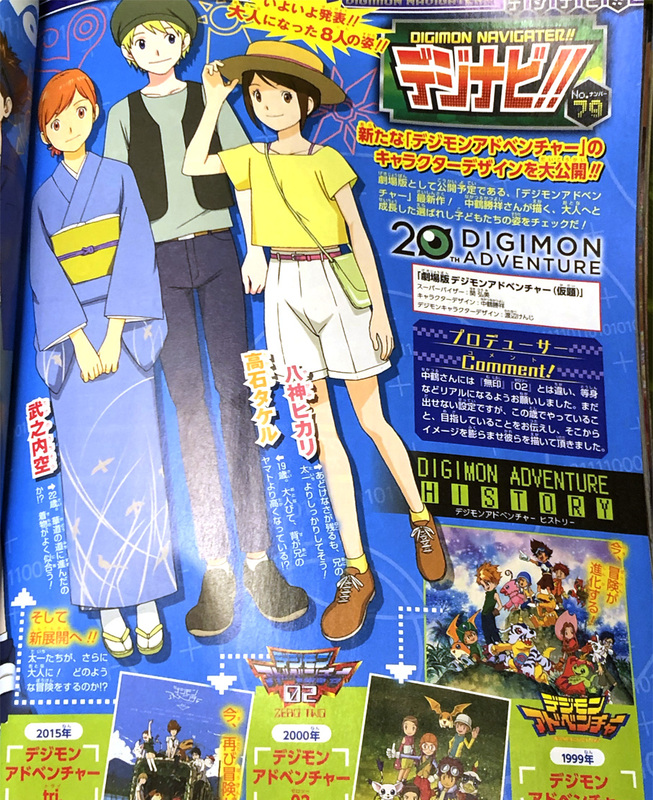 Edit: At the bottom right there is a part of the article Digimon Adventure History and one of the arrows points towards 02. Yay acknowledgement. 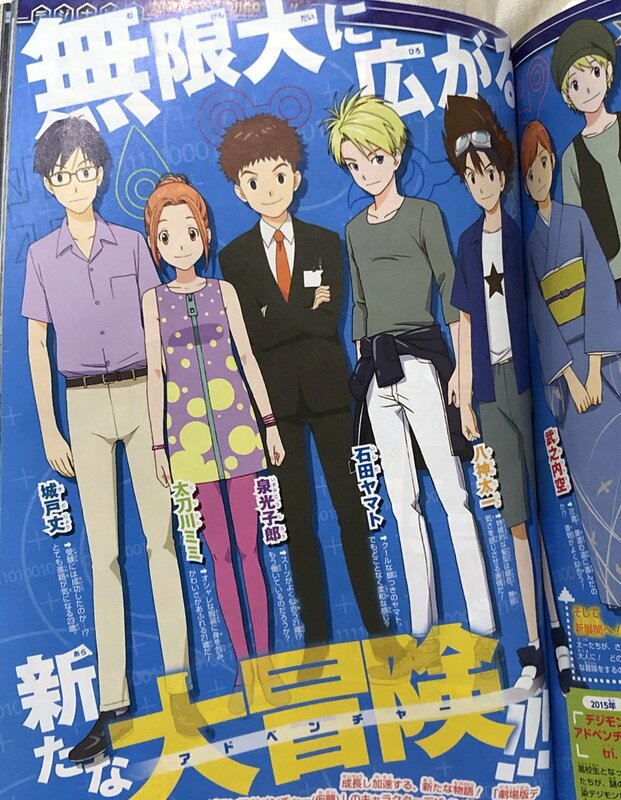 I definitely like it better than the bland tri artwork, but at the same time I think I actually prefered Yamato and Taichi’s earlier concept artwork for this project. It has that distinctive Digimon feeling though, so I’m onboard. My goodness, TK becoming the tallest of the group is amusing, but he's 1000% leg now! Overall everyone looks pretty great, a slight drawback with the artstyle is that half the group doesn't actually look any older but they're still pretty solid overall. I like Joe's design a lot compared to Tri, I guess the blue hair helps! Though the fact that Izzy has a copypaste of his Adventure head is both amusing and unnerving at the same time. Everyone looks okay, thank God Taichi looks like Taichi again after that terrible early version. 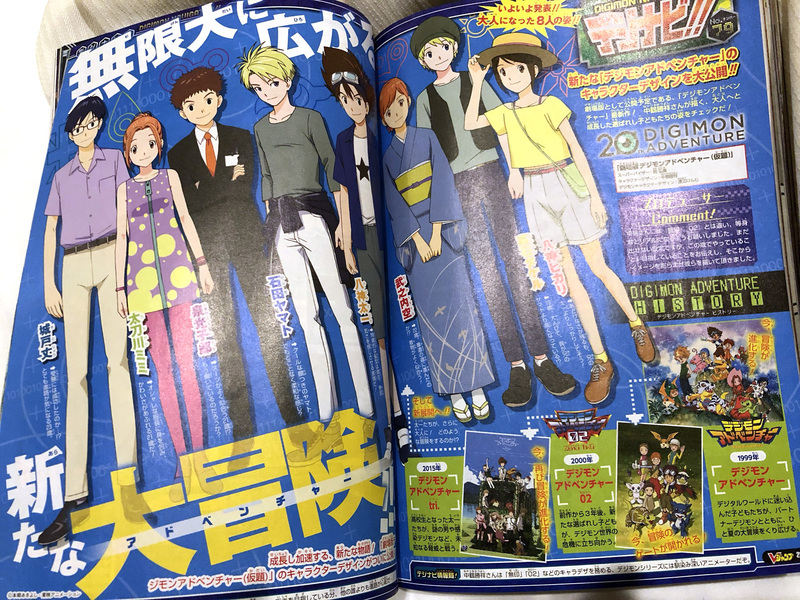 I would probably have appreciated it more if their looks here were more like a direct follow-up from their Tri designs rather than their first season designs, but I guess they did it to make the people who complained about Tri happy or something. Not a bad thing! All in all, it is the story I care about. I hope it's more concise and engaging overall this time. Do we have any information about whether it will be a standalone film or a film series yet? Daisuke and co: "Are we joke to you?" Not gonna lie, a little bit disappointed that it is just the kids themselves and nothing else of substance. Even the article itself is mostly generic hype without really saying much. Not yet. However, given that the article uses "劇場版" it makes me feel that it's more likely to be one big film rather than a series that got a theatrical run like Tri.